Paul E. Vallely retired in 1991 from the US Army as Deputy Commanding General, US Army, Pacific in Honolulu, Hawaii. General Vallely graduated from the US Military Academy at West Point and was commissioned in the Army in 1961 serving a distinguishing career of 32 years in the Army. He served in many overseas theaters to include Europe and the Pacific Rim Countries as well as two combat tours in Vietnam. He has served on US security assistance missions on civilian-military relations to Europe, Japan, Korea, Thailand, Indonesia and Central America with in-country experience in Indonesia, Columbia, El Salvador, Panama, Honduras and Guatemala. General Vallely is a graduate of the Infantry School, Ranger and Airborne Schools, Jumpmaster School, the Command and General Staff School, The Industrial College of the Armed Forces and the Army War College. His combat service in Vietnam included positions as infantry company commander, intelligence officer, operations officer, military advisor and aide-de-camp. He has over fifteen (15) years experience in Special Operations, Psychological and Civil-Military Operations. He was one of the first nominees for Assistant Secretary of Defense for Special Operations under President Reagan. From 1982-1986, he commanded the 351st Civil Affairs Command that included all Special Forces, Psychological Warfare and Civil Military units in the Western United States and Hawaii. He was the first President of the National Psychological Operations Association. His units participated in worldwide missions in Europe, Africa, Central America, Japan, Solomon Islands, Guam, Belgium, Korea and Thailand. He has served as a consultant to the Commanding General of the Special Operations Command as well as the DOD Anti-Drug and Counter -Terrorist Task Forces. He also designed and developed the Host-Nation Support Program in the Pacific for DOD and the State Department. Most recently, he has in-country security assistance - experience in El Salvador, Columbia and Indonesia in the development of civil-military relations interfacing with senior level military and civilian leadership. 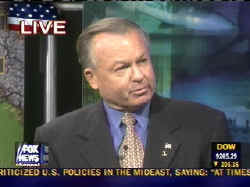 General Vallely is a military analyst for FOX News Channel and is a guest on many nationally syndicated radio talk shows. He is also a guest lecturer on the War on Terror. He has co-authored a book entitled , The Endgame, Winning the War on Terror.